I don’t know how much news you get back home about what is happening in Burma. It’s hard to comprehend that civil war can go on for such a long period of time that it just become part of every day life. Can you imagine a civil war that began in 1948…..and continues today.? It was happening before I was born, and before my mother was born! The political climate and policies of our neighboring countries has a significant impact on the work we are doing here with human trafficking. There are a number of elements that make people easier prey for human traffickers. Poverty and drugs are two of them, but there are two other major factors: war and illegal immigration. War forces people into situations that separate them from family, reduces their ability to earn income, destroys farm land, houses and livelihoods. 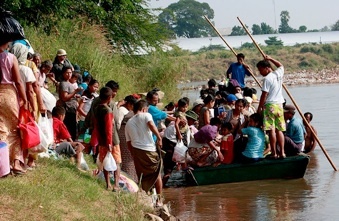 Some reports estimate that 250,000 people have fled from Burma and now reside in Northern Thailand. The estimated total number of illegal immigrant in Thailand is 500,000. They are people just like you and I, except they were born into a political climate that sees them grow up consumed in a civil war they didn’t start. I won’t write more on the political climate, however there is plenty of news articles on the situation in Burma that you can read online. In the past two days 20,000 people have fled to Thailand! Tobiah’s school (Grace International) organized to take blankets and clothes to assist these displaced people. This morning before school. Tobi got out a few t-shirts and added them to the pile of Andie and my clothes and we delivered them to his school this morning. It’s such a small thing to do! It really feels like it is not nearly enough to give a bag of clothes to help 20,000 people. I can’t possible comprehend the situation these people are faced with, let alone explain it to Tobi. So I just simply said to him that some people needed help and asked was he willing to give some clothes of his to some people that didn’t have any or just needed some assistance? I am so proud of Tobi. He sure has difficulty sharing many items in our home! Many times he thinks he is the centre of the word (as young children often do) but today he showed kindness and compassion. He willingly gave something of his to someone he doesn’t even know, just because they needed help. PS I encourage you to read up on the situation in Burma.